Today is going to be a short post, it was just one of those Monday’s, nothing seemed to go right. 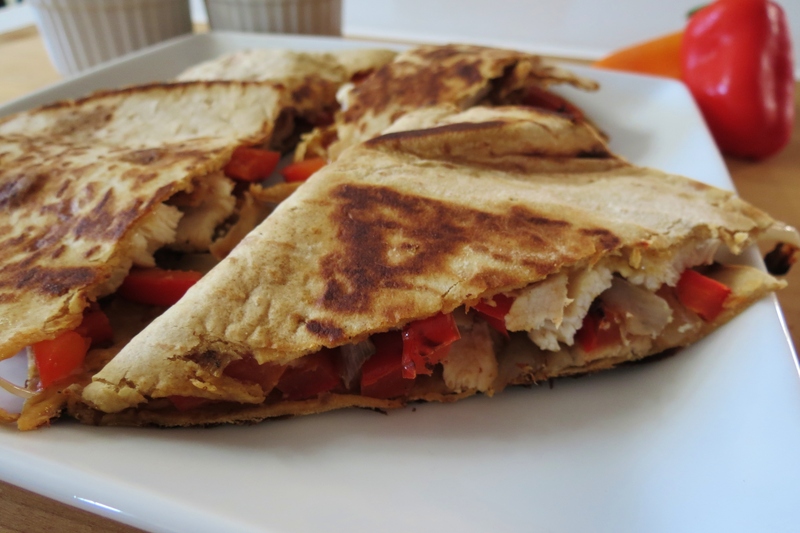 I didn’t get a chance to make a detailed dinner, but I did make one of my favorite quick dishes, the Chicken Fajita Quesadilla. This meal is quick, low-calorie and loaded with lots of flavor. The Chicken Faijtas is one of my favorite type of burritos. However, if you throw onions and peppers on anything and I’m all over it. I used a FlatOut Bread to make my quesadilla, but you can always use a flour tortilla. This meal probably takes about 10 minutes to make. I sauted my onions and peppers in a skillet for about 5 minutes, then added it to my FlatOut Bread. Then I added the chicken and cheese, yum, yum. Place the quesadilla right back in the skillet to cook for about 2 minutes per side. If you don’t have already cooked chicken, you can add uncooked chicken to the skillet with the peppers and onions, and cook until no longer pink. Such an easy meal. I served my quesadilla with greek yogurt and salsa. Oh, you don’t see it here but I also added hot sauce. 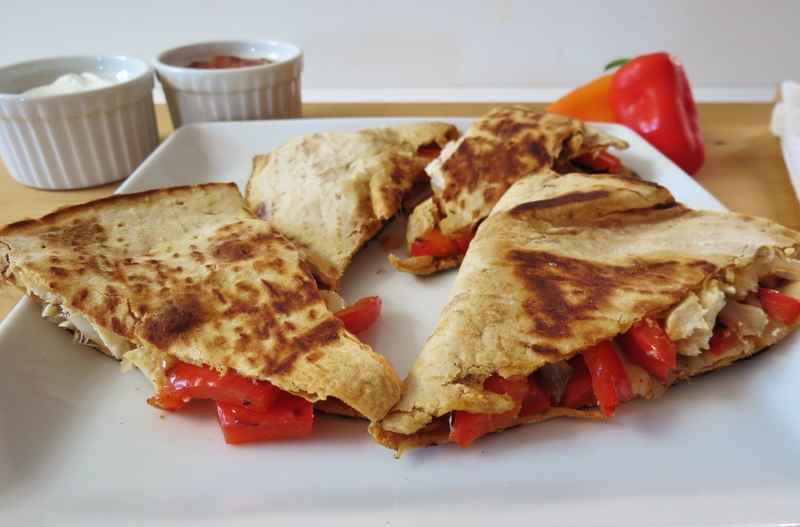 Quesadilla’s are so ingredient friendly, you can add any of your favorite goodies to it. Just be careful not to make it to fat, otherwise all the yumminess will flow out the sides. Though I don’t see anything wrong with that!! 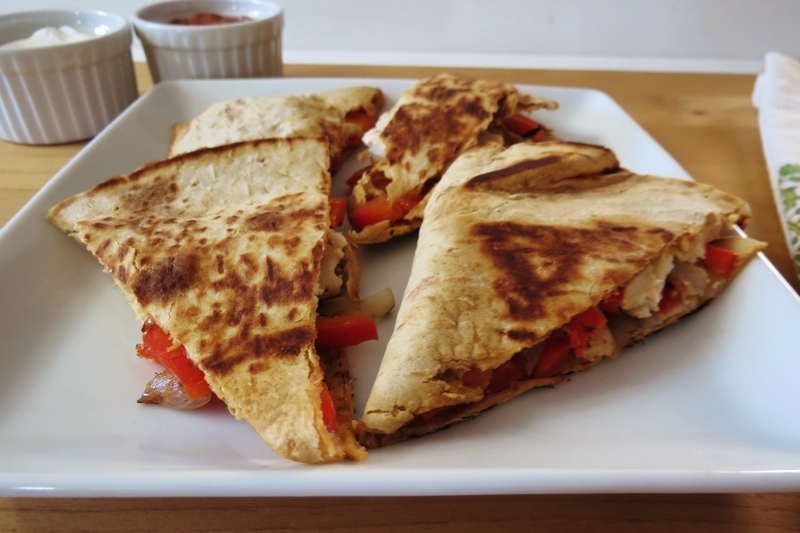 A healthy, quick spin on the traditional chicken fajita quesadilla. 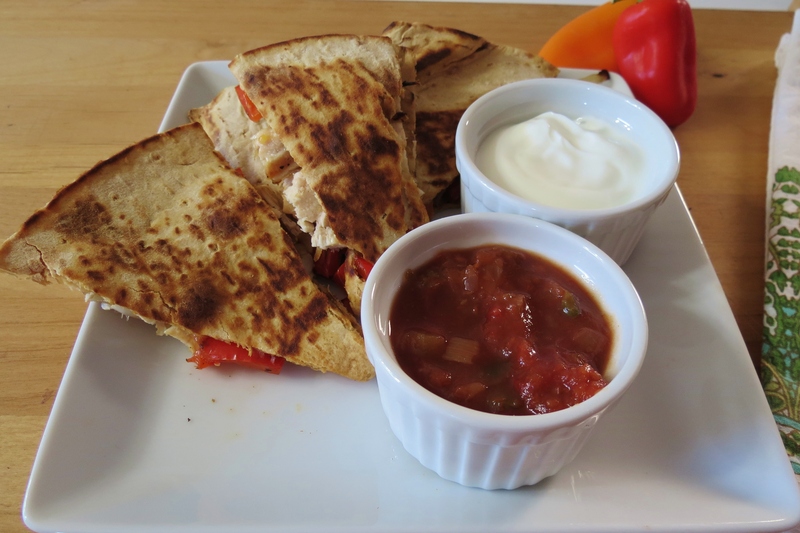 Made with onions, peppers, cheese and chicken, served with a side of salsa and greek yogurt. Spray a skillet with cooking spray. Add onions and peppers and cook until soften, about 5 minutes. 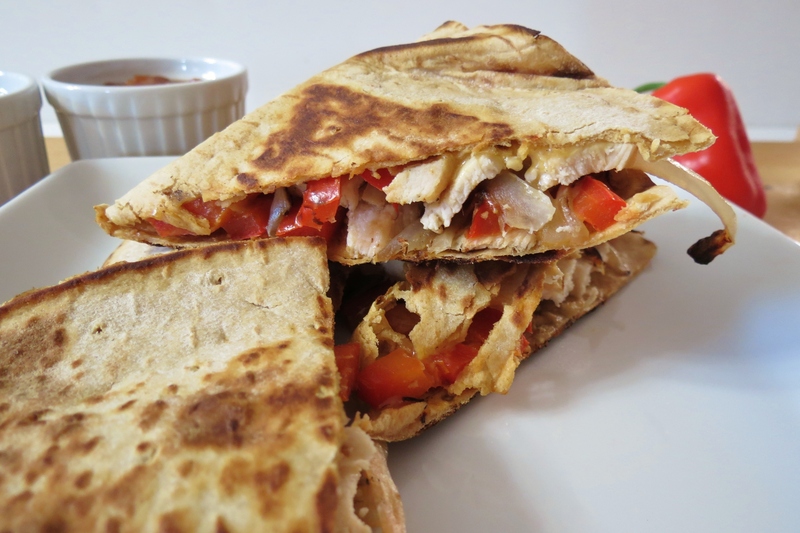 Add onions, peppers, chicken and cheese onto half of Flat Out Bread or Tortilla, fold over. Spray skillet with cooking spray, Add tortilla to skillet and cook until light golden, flip and cook other side until lightly golden and cheese is melted, about 2 minutes per side. Well that’s it for today!! Time for me to get going. Sorry it’s so short today, but time has gotten away from me and I have so much to do. 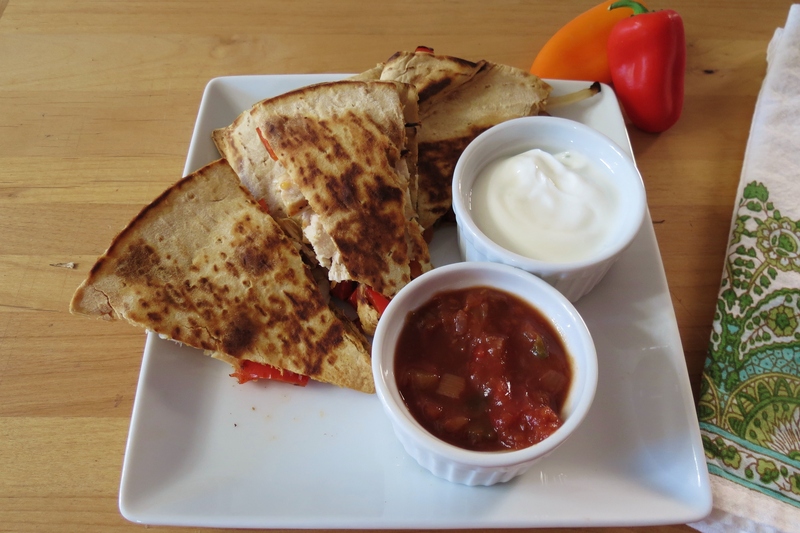 I love simple quesadillas – and you save SO many calories making them at home! I agree, that’s why I make them at home instead of getting them at a restaurant. Love all of the flavors in this quesadilla! Thanks Jessica! I love peppers and onions together, such a great combo! This looks delicious and very simple to make. This would be something my daughter and I can share making. Thanks for the invite!! I’ll stop by after I type this! 🙂 The quesadillas are so fun and easy and I am sure your daughter will love them, especially if she helps making them. I’ve been having some trouble finding some good tortillas. Even the ones that claim to be healthy are just loaded with calories, some even have enough for 3/4 of a meal! I’ve seen some recipes for making your own so maybe I’ll try that. Do you get your FlatOut bread from Trader Joes? I know tortillas are so high in calories. I bought my FlatOut bread near the deli section of my grocery store. My Target used to carry it but they don’t anymore. There only 90 calories each and full of fiber and protein. If you can’t find tortilla shells, look for LaTortilla Factory. They have some pretty healthy ones. Quesadillas are my go-to dinner when I’m pressed for time. And I never get sick of them! Plus it’s a great way to sneak in extra veggies! I couldn’t agree with you more!! I love quesadilla’s!! I don’t think I could get sick of them either!